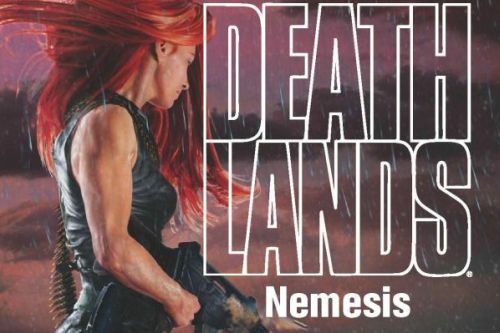 The Deathlands series is an action-adventure/science fiction series by James Axler. The series is set in a post-apocalyptic United States. Very few survived, and many who did were horribly mutated. A group of survivors led by Ryan Cawdor planning to escape the barren wasteland, meanwhile encountering terrifying mutated lifeforms and other beings with their own agendas. The series is followed up by the Outlanders series. Chronologically, Encounter comes before Pilgrimage to Hell and should be read first if reading in chronological order. Deathlands Synopses: In Crater Lake (book 4 of the Deathlands series), Ryan Cawdor and his group of post-holocaust survivors come across a beautiful valley that was somehow shielding by the nuclear blast that destroyed the planet Earth. The temptation seems too great for the group, but they are captured and brought beneath a volcano, which is home to a community of inbred scientists who are trying to looking to committ genocide, unaware of what has happened to the inhabitants of Earth. Moon Fate is the sixteenth book in James Axler’s Deathlands series. Ryan Cawdor and his group of warriors battle a mutant tyrant who is willing to sacrifice human lives in order to find a better way of life in the Deathlands.